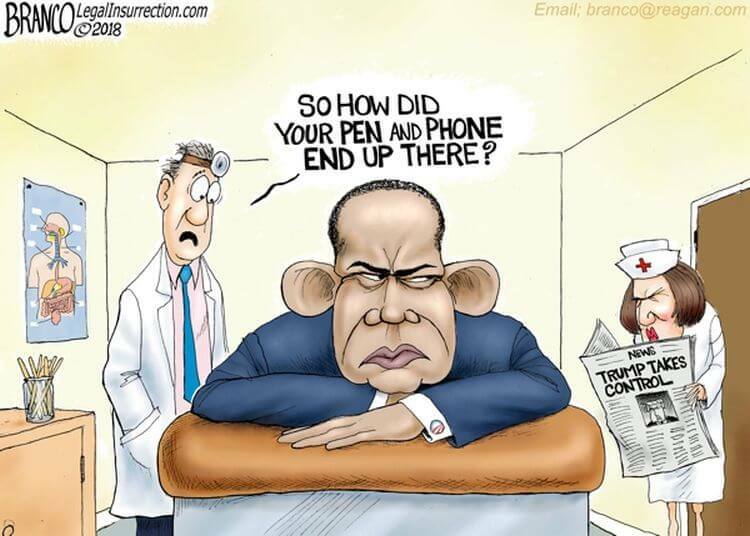 Have you ever seen a better cartoon of Barack Obama? Boom! Too bad, so sad for poor Barack Obama. In a dangerous turn for Democrats, black support for President Trump is skyrocketing. It turns out the era of politics driven by racial identity may be over. With Barack Obama now in America’s collective rear-view mirror – and his race-motivated politics behind us, maybe we can get back to becoming one America. Support for President Trump in the African American community stands at 16 percent. While these sound like dismal numbers, they’re actually historically high. Shockingly so, even, especially considering Trump only received 8 percent of the black vote in November 2016. An equally good number for the President is the “not-sure” rating among blacks. When African Americans were asked whether they approved, disapproved or were “not sure,” one in ten were in the latter category. That raises the possibility that Trump’s approval could rise to 26 percent among a minority population that typically votes almost exclusively for Democrats. The latest numbers come from a YouGov/Economist poll and was reported by The Federalist. And that 16 percent is up from just a couple months ago. The same poll reported in January that Trump’s approval was 10 percent among black Americans – they keep getting better. Even better: The YouGov poll asks “all voters,” and not just “registered voters.” The latter category consistently bodes better for Republican candidates.